Words by Kevin Doocey on July 23, 2009 . It seems that the hierarchy have learned nowt over the last season and continue to play their own game, which is affecting all of us. Mike Ashley doesn’t know what he’s doing sadly enough and his puppets aren’t much better. Perhaps I’m being a little too harsh on them, after all Ashley did invest a whole lot of money into Newcastle United with very little, no, return. You would have to feel a little sympathy for him in that sense but he made no steps whatsoever to make amends and sort the club and effectively brought the club to it’s knees, meaning here we are in the Coca Cola Championship. I know there are a lot of pro-Ashley out there but you really have to sit and have a hard think about what has occurred. Now it seems, as we enter out first lower tier competitive league tie with West Brom Chris Hughton, who in fairness has been a loyal, long term servant of Newcastle’s, will lead them down to The Hawthorns to play a side who will be favourites to make it back up to the Premier League at first attempt. More than likely we’ll be putting out pretty much the same side that ‘tried’ to avoid relegation at Villa Park on that dark day. Harper, Coloccini, Steven Taylor, Obafemi Martins, Damien Duff, Jonas Gutierrez, Kevin Nolan could all line out in the away strip, who would’ve thought that on the 24th of May? Mike Ashley has to be a realist, and he will have to sell at the rate of recession. 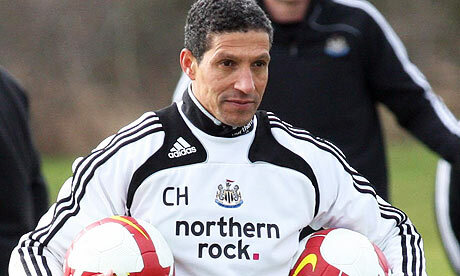 70.000.000is good, and if he can get an extra 15, say 85....and 10...more if Newcastle climb from the Championship. Newcastle have only won a second div title, Michael Owen scores for Man-U, but not for the Magpies, very sad. Yeah, Shearer must be getting sick of waiting, you can't blame him really.